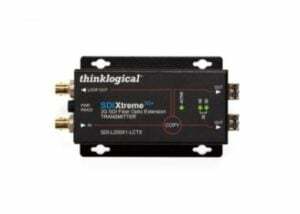 The SDI Xtreme 3G product series is a compact, broadcast quality, SDI over fiber extension system. The system is designed to transmit up to two SD/HD signals or one 3G SDI signal with or without embedded audio and data, and is SMPTE 424M, 292M, 259M, 372M and 425 level A and B compliant. In addition, this fiber based transport system gives users the assurance that each signal is immune to video pathological signals over the entire length of the fiber interconnect, while supporting all pathological patterns at all rates. The system also supports either single or multimode fiber, and is fully compatible with Thinklogical’s VX and HDX Router line of products.